In the previous part of this tutorial, we assumed constant input powers of all channels. Now, we will consider dynamic simulations, where all input powers may be time-dependent. After all, fiber amplifiers and lasers are often operated with light pulses and/or with pulsed pump sources. Any input powers (e.g. of pump and signal beams) may be time-dependent. A flexible software as our RP Fiber Power can handle arbitrary given functions or tabulated values for time-dependent input powers of all channels. The calculation of gain or loss values gj(z) cannot be done based on intensities only, but need to take into account dynamic saturation effects. In other words, the gain values do not simply depend on the current optical intensities, but on their values in the near past. Essentially, the software needs to introduce additional dynamical variables for the excitations of the laser-active ions. Their temporal evolution is calculated by numerically integrating the rate equations, which we have discussed in section 4. That is in principle not difficult, even for rate equations involving nonlinear terms. For example, a fiber amplifier may first be pumped for some period of time, and thereafter a short signal pulse (e.g. of Gaussian or super-Gaussian temporal shape) is injected. During the pumping phase, the (not yet relevant) signal gain steadily rises. When the signal pulse is injected, it originally profits from a high gain, but then quickly saturates that gain. As a result, further parts of the pulse will experience a reduced gain and acquire correspondingly lower output powers. This can result in substantial distortions of the temporal pulse shape. Figure 1 shows a numerical example, taken from a detailed case study. Figure 1: Output power and ytterbium excitation versus time for an ytterbium-doped fiber amplifier with pulsed pump and signal. Propagation times can often be ignored in pulsed amplifier systems. Note that in such a case we can safely ignore the propagation times, i.e., the time delays arising from light propagation through the amplifier fiber. Even if pulse durations get shorter than the propagation time, it often does not matter that different parts of the fiber “see” the pulses at slightly different times. After all, typically level lifetimes are far longer. The temporal step size used in the numerical algorithm may be larger or smaller than the propagation time; it just needs to be small enough to properly sample all temporal features, including saturation effects. Note that the amplifier gain can drop very fast if it is saturated by a very high signal intensity. Therefore, the numerical step size may have to be far below the lifetimes of metastable levels. See also part 7 of our fiber amplifier tutorial, which discusses the behavior of fiber amplifiers for the amplification of nanosecond pulses. For modeling Q-switched lasers, it is essential to consider the propagation time of light in the resonator. We need to use a temporal step size which is only a fraction of the resonator's round-trip time. 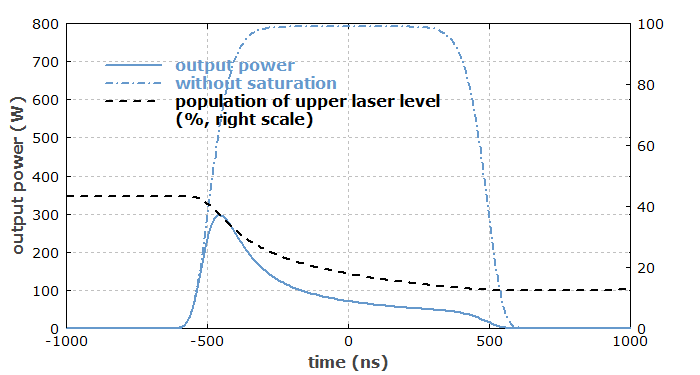 Within one temporal step, the whole power distribution in the laser device is spatially shifted by a fraction of the device length and at the same time affected by gain or losses. There may also be time delays outside the active fiber, as the laser resonator may contain additional parts such as free-space regions containing a modulator (Q-switch). Therefore, at least for the laser light one needs some kind of numerical buffers for storing optical power values corresponding to locations outside the fiber. Neither the needed equations nor the algorithm are very complicated in principle. However, the implementation is a little tedious due to various “bookkeeping” requirements. As an example case, we can use a case study for a Q-switched fiber laser which we have made with our software RP Fiber Power. Figure 2: Output power and ytterbium excitation versus time. 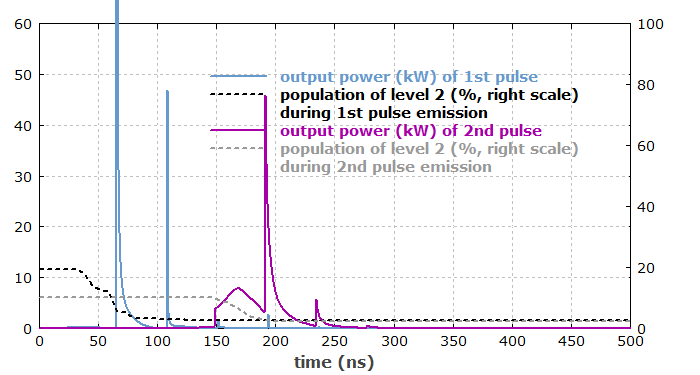 Figure 2 shows the evolution of output power and excitation level during the first two pulse cycles after switching on that laser. The resulting pulse shapes may seem quite surprising; there is a strong variation of power within a single round-trip time, which would normally not occur in a Q-switched bulk laser. An important factor behind this phenomenon is the high gain of an active fiber. Before the Q-switch is opened (made transparent), ASE leads to a strongly inhomogeneous distribution of optical power (at a rather low level) within the active fiber. If the Q-switch is then opened very quickly, that inhomogeneous power distribution starts to travel around the resonator, producing that spike structure at the output. The details can be understood with careful thinking, but are definitely more complicated in these high-gain situations – making it more necessary, of course, to study this numerically. One can also study aspects like a finite switching time of the Q-switch. Go to Part 7: Ultrashort pulses, or back to the start page.